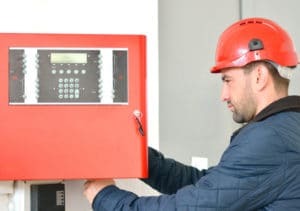 Fire extinguisher maintenance and inspection industry is an intricate business that requires the help of a specialized and fine-tuned fire extinguisher software. Running a fire extinguisher maintenance business also requires high technical expertise, specialized equipment, and up-to-date licensing and certification. However, as a fire extinguisher maintenance business, what you are really selling to your customers is a peace of mind and a guarantee of safety. Therefore, it is very important to present a professional, efficient, and caring image to your clients, so that they know they can rely on your company and that they can feel safe and secure. You can achieve this with the help of an integrated business management software application customized for fire extinguisher businesses. 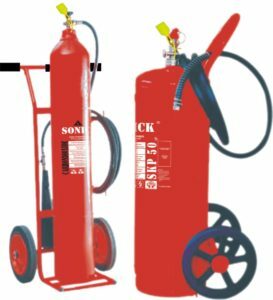 Fire extinguishers are the kind of product that require regular mandated inspection and service after the sale and fire extinguisher maintenance can provide a stable source of profit for your business for years to come. With efficient business management, a fire extinguisher company will provide a steady stream of repeat business for fire extinguisher recharging, mandated safety inspections, scheduled maintenance checks, and additional equipment sales. 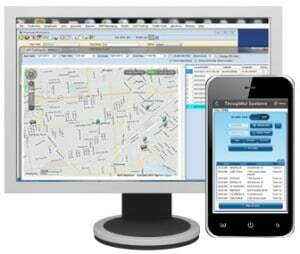 Our Scheduling Manager software for fire extinguisher maintenance businesses provides the tools for effective Customer Relations Management (CRM), efficient scheduling, and accurate fire safety equipment tracking. As a fully integrated business management software package, Scheduling Manager helps you in establishing a loyal customer base and allows you to focus on marketing services that will bring you the most money. Powerful management tools for mobile workforce management! 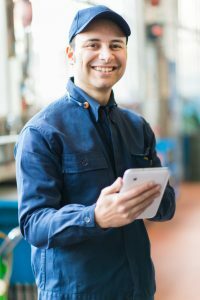 As a fire extinguisher maintenance business, you need to keep track of multiple employees working at different remote locations throughout the day. Our SM-Mobile App keeps yor field technician updated on their job schedule and the current needs of the customer.On their mobile device in the field, the employees can take photosof teh job site, record customer’s signature, edit custom PDF forms, produce invoices, and receive payments, With our GPS-enabled tracking, they can head head to the next job immediately, with all the information thwey need on their mobile device.SM-Mobile App runs on Apple and Android mobile devices. Accurately record and track information about every fire extinguisher on your customers’ premises with the integrated Equipment Manager. Store all information regarding each fire extinguisher and readily print out work orders for your employees. You can easily assign specific fire extinguishers to a job and print out detailed Equipment Reports showing you the maintenance history of each fire extinguisher. extinguisher maintenance businesses help you to determine routes and calculate travel time between jobs. With Scheduling Manager‘s “Find Best Employee” feature, you can easily find the ideal tech to assign to a job. This feature makes suggestions for job booking based on when your employees will be in the same area, reducing trip times between jobs and increasing efficiency. We are very pleased with the flexibility Scheduling Manager offers. Thoughtful Systems is incredible to work with, completely understanding of our industry needs and our specific business!